Ethereal, elegant, and all kinds of pretty, today's styled shoot by Michelle Leo Events sure is a pretty one! From the florals, to the bridesmaids dresses, to the perfectly coordinated color palette, this styled shoot mixes two of my favorite shades: Lilac and peach! And lucky for us, Alixann Loosle Photography was there to capture every single second. From the Designer, "While discussing the design of a Fall wedding with one of my brides, I couldn’t help but notice my client was frustrated at the common impression that because she was having a fall wedding, her design elements would be limited to the standard fall palette of reds, yellows, oranges and browns and that guests would have to be surrounded by pumpkins, spice candles, and maple leaves." "I didn’t want my bride to feel limited just because she was having a Fall wedding. Therefore, I designed a lovely peach and lilac setting to inspire and demonstrate the power of color." More from the Designer, "About my color choices: I wanted to use a deep, romantic, and striking color. I couldn’t help but notice that part of what makes Fall such a beautiful season is the striking contrast in colors from the bright yellows to the deep reds and rich browns. I decided if I was going to use shades of purple, I would need a lighter color to help soften the look. I selected peach for a few reasons: it provides a softer alternative to the popular Fall color orange. Plus, it’s such a calming, feminine, and soft color." "I also chose it because peach and lilac is an unlikely color combination and yet they work so beautifully together. In addition to these colors, I introduced elements of golds and coppers throughout the details. I wanted to explore a watercolor look, which would allow all the colors to run together much like the Fall leaves did outside my office window. But I didn’t want the paper suite to be the only area where this style appeared in the shoot, so I decided to incorporate the watercolor design on the wedding cake as well." Goodness! What a beautiful alternative for brides who choose to say “I do” during the Autumn bridal season. Thanks to all the lovely vendors who worked so hard to make this shoot come to life! Bravo. This definitely has me dreaming of Fall (my favorite season of all time) and all the pretty possibilities! 14 Comments " Lilac and Peach: Hues You'll Heart "
This is so pretty - I adore it! Beautiful work! Gorgeous colors! Love this take on a Fall palette! Gorgeous, gorgeous, gorgeous...this is a wonderful fall palette! Such a pretty palette and a beautiful shoot! These colors are just so perfect together! Great for fall, but so full of summer touches too! Love this colour combination - absolutely stunnin! Those dresses, that cake, the florals...everything is so beautiful! Sheer perfection! 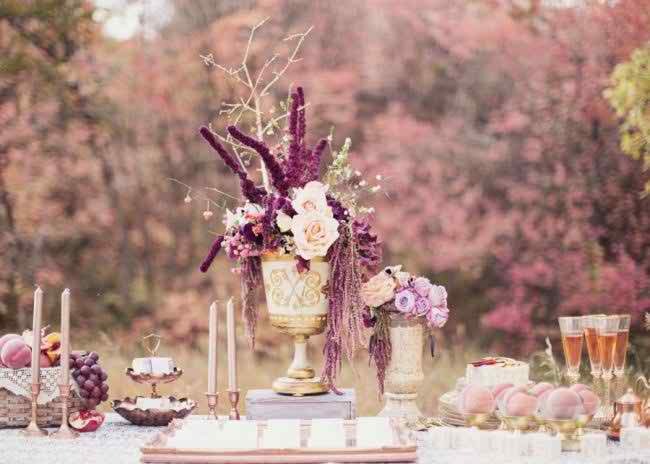 This is one of my favourite colour combinations and what a dreamy shoot!